A culture clash or a match made in heaven - or both, as French country meets a 1950's Americana classic in this cool, garden-fresh soup? Either way it's summer in a bowl! Yesterday I made one of my favorite summer soups, a zucchini vichyssoise loosely based on Ina Garten's recipe from her book, Barefoot in Paris. It's an old stand by in my kitchen during the summertime - and a great way to use up zucchini. But as I stood at the stove and watched it simmer I realized that it just wasn't going to satisfy my craving for something cool and fresh the way it usually does, garnished with ribbons of julienned zucchini and fresh snipped chives. No, yesterday I wanted something more. Something zesty, vinegary, fresh and crunchy. Corn is what I wanted; more specifically, corn relish! The kind my grandmother would make & store in frilly little canning jars to be pulled out and put on our hot dogs while we watched the Cubs on T.V. And, by the way, I'm starting something new here on the blog. Here's a funny little secret: I have a backlog of approximately 75 recipes on this blog, just waiting to be published! That's a lot of recipes! The problem is time; there's not enough of it during the day to write a post for each and every one. So, in the past, I've been combining recipes into one large post, much like compiling dishes for a grand feast, but even that didn't work. However, if you follow me on Instagram you know that I post recipes there all the time. So why not share the love & post the recipes here, too. Novel concept, no? So we'll give it a whirl, with a short, "Recipe of the Day" format for those recipes I'm sharing in both places. (Okay, "recipe of the day" seems overly optimistic. Let's start with "Recipe of the Week," give or take a few days, and see how it goes.) While it may be redundant, I care too much about this little space on the web to abandon it completely. Of course, I'll continue sharing longer posts as time allows. So, without further delay, here's today's "Recipe of the Week!" In a large pot sauté the leeks in the oil over medium heat until they just begin to soften. Add the garlic and sauté for a minute longer. Add the potatoes & zucchini and cook, stirring, for another 5 minutes. Add the broth, salt & pepper and bring to a simmer. Cover and simmer for 30 minutes. Remove from the heat and allow to cool slightly. 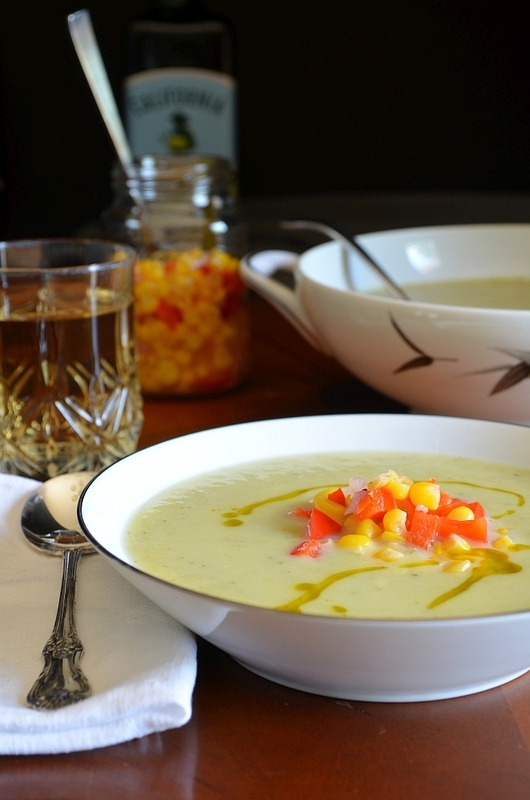 Using an immersion blender or a food mill, purée the soup until smooth. Stir in the cream and cool to room temperature. Cover and place in the refrigerator until chilled. Serve chilled with a drizzle of good extra virgin olive oil. 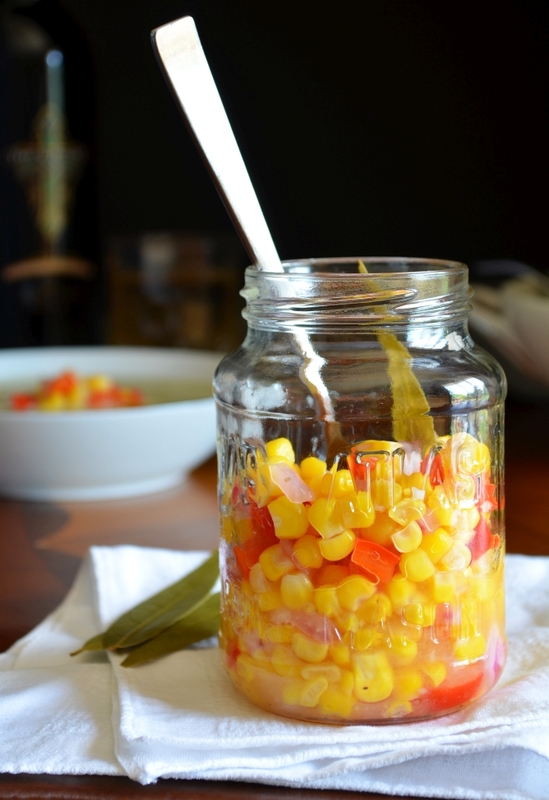 Top each bowl with corn relish. In a small sauce pan bring the vinegar, sugar, salt, celery seed, mustard seed, bay leaf & garlic to a simmer, stirring to dissolve the sugar. Add the frozen corn and bring back to a simmer. Cook for 3 minutes. Place the chopped pepper and onion in a heat safe bowl. Pour the hot corn and vinegar mixture over the vegetables and stir to combine. Cool to room temperature, then place in the fridge to cool completely, until ready to serve.